I hear so often from friends, family and others about not liking pork chops. I can understand this because depending on the way pork chops are made they can be way too dry. However, I have also been told that I make some of the best pork chop recipes and those who thought they didn’t like them, now do. The best way to make them is in the crock pot. They come out soft and moist and just melt in your mouth. However, this recipe makes them on the stovetop and while they are not as soft, they are so good simmered in broth for incredible flavor! I am obsessed with herbs, especially fresh herbs and in this dish they really bring out flavor and zest. Herb-Rubbed Pork Chops: pan-seared and simmered in broth this recipe is the perfect easy dinner! Pair this easy dinner with mashed potatoes, salad, or fresh green beans. I hope it will become a staple in your house as it has become in ours. Enjoy! In a small bowl, combine the parsley, marjoram, sage, garlic powder, salt and pepper. Brush both sides of pork chops with 1 tsp oil, rub with herb mixture. In a large nonstick skillet coated with cooking spray, cook chops in remaining oil over medium heat, 3-4 minutes per side or until lightly browned. Remove and keep warm. Add broth and and additional broth, stirring to loosen browned bits. Bring to a boil. Return chops to pan. Reduce heat, cover, and simmer for 4-5 minutes. Serve chops with pan juices. 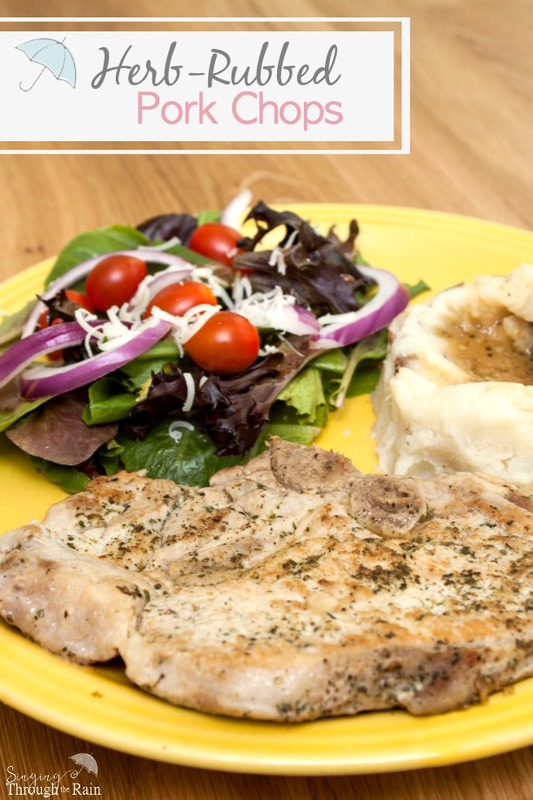 Looking for another favorite pork chop recipe of mine? 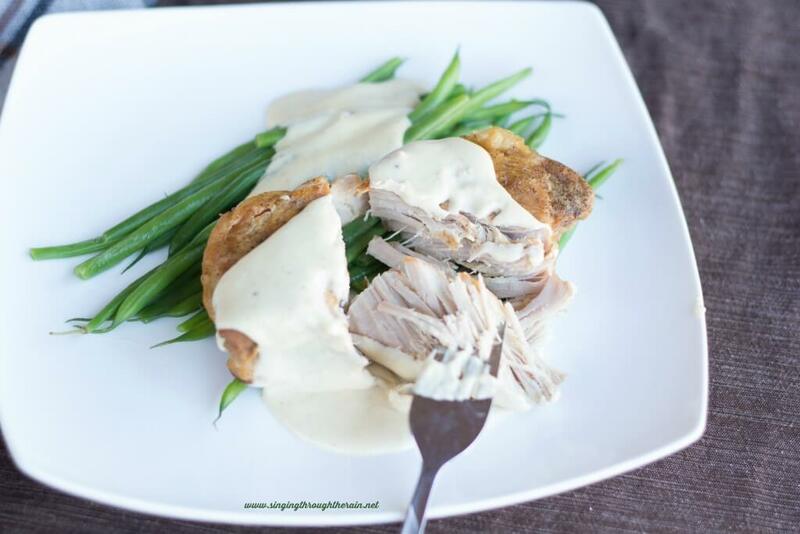 Check out these sour cream pork chops made in the crock pot! What about YOU? Do you like pork chops? What’s your favorite way to make them? This looks so good! I think we'll definitely be giving it a try soon. Thanks for sharing the recipe! This sounds delicious. I think I'll try them. It's good to find new recipes, especially ones that use ingredients that I can eat.